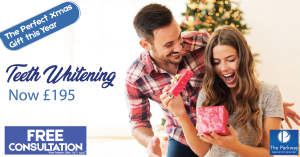 Up to the end of December 2018 we are running a special offer on Teeth Whitening so you can confidently flash your pearly whites at all those festive events. Are you struggling to find friends, family or loved ones a perfect present this Christmas? Why not give them the perfect gift of a new smile this Christmas. We are now offering our popular Parkway Gift Vouchers for Whitening and other treatments this Christmas. To order you voucher please contact us via phone or via the website.